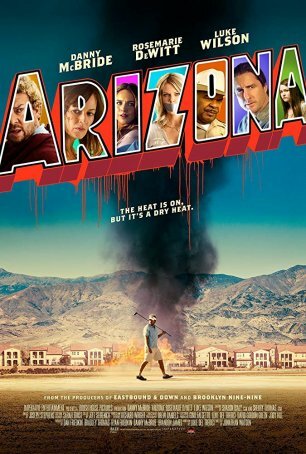 Arizona illustrates that, if a filmmaker intends to make a comedy-thriller, (s)he would be better served by emphasizing either the humor or the suspense, not trying to walk some invisible line down the middle. By choosing the latter option, first-time director Jonathan Watson crafts a film that’s neither funny nor exciting, although it often seems to be straining to be one or the other. It’s a tonal mess and its inconsistencies make it a frustrating viewing experience. The movie is set during the 2009 housing crisis and never lets us forget the time and place. Arizona, like Florida, was especially hard-hit and we’re treated to views of neighborhoods and gated communities where nearly every upscale house is for sale and those that aren’t are in danger of foreclosure. The chronicle of broken dreams is highlighted by the opening scene in which a realtor’s attempts to sell a house are interrupted by screams as the woman next-door discovers that her husband has tried to hang himself. The main storyline features the abduction of that realtor, Cassie (Rosemarie DeWitt), by a deranged former client, Sonny (Danny McBride). Having lost everything – including, apparently, his mind – he goes on a crime spree that includes breaking-and-entering and multiple murders. He keeps Cassie alive out of a sense of kinship and a desire to have someone to rant to (although he frequently castigates her for lying to him). In order to ensure her compliance, he also nabs her teenage daughter, Morgan (Lolli Sorenson). During a brief escape, Cassie manages to call for help from her clueless but good-hearted ex-husband, Scott (Luke Wilson), who rides to the rescue along with his new wife, Kelsey (Elizabeth Gillies). The cast is sufficiently high profile to attract some interest. Although Rosemarie DeWitt, Danny McBride, and Luke Wilson aren’t A-listers, they are well-known. Of the three, McBride comes the closest to being “in form” and, to the extent that there are any laughs in Arizona, they come from his antics. Luke Wilson, on the other hand, seems almost like he’s on Prozac, although his ultra low-key approach to acting has been evident in almost all of his recent appearances. There are cameos from David Alan Grier and (an uncredited) Seth Rogen. To be fair to Watson and credited screenwriter Luke Del Tredici, Arizona offers a few delicious moments. The film opens strong and there’s a lovely little unexpected twist near the end. Unfortunately, the low points overwhelm these infrequent peaks. Too much of the movie feels familiar and an extended chase during the second half drags on forever with little in the way of tension to relieve the growing boredom. The climax follows the slasher/killer template without exception. And, although one doesn’t expect any heavy dramatic lifting from a comedy/thriller, the reaction of two characters to something that happens late in the proceedings rings false. It’s as if, having come up with a cool idea, the filmmakers couldn’t figure out how to integrate it organically into the film. At only 85 minutes, Arizona is short but it somehow seems longer than the running length and isn’t really worth the cost in lost time of watching it.